This is not one of Mysticpuma's normal updates, but it was something the FM team felt was necessary to publish. -The Bf-110D and Bf-110E were both inferior in performance to the Bf-110C's. This was mainly due to extra weight and various modifications and/or additions to the fuselage. We do not believe players will fly these aircraft considering their degraded performance, so the amount of work involved to create them is not productive. -It was not till the Bf-110F model arrived with the DB-601F engines that the aircraft saw a significant improvement in performance. This aircraft fits a later time period that what we have planned for TF 5.0, so will need to wait till TF 6.0. But although we are not planning new 110 models, the existing Bf-110C models will be seeing quite a few changes and we will introduce new variants of this series. Part of this is due to an errors in regards to the naming and equipment of the existing models which I only became aware of six months after TF 4.312 was released. This is originally the fault of the original developers and their mistaken naming conventions, and partially the fault of TF members who didn't pick up the errors and continued with the same namings. I was not personally a part of the TF development of the Bf-110's, this was handled by a German member who was a specialist in the 110, and another member of the FM team. They both did much great work with the 110's, making changes to the cockpits, revising the fuel tank controls, etc. etc... Unfortunately they missed the errors with the naming conventions and I was too busy with work on the 109's and British aircraft to notice... in any case, both of them have retired from their involvement in TF. TF apologizes for this error, it was not intentional. The errors in the game and mod are focused around the ground attack variants. The actual first ground attack C model variant developed was the Bf-110C-4B, which had a smaller bomb load than what we see on the C-7's in the game, (only two 250 kg bombs available) and in addition, the C-4B was not equipped with the standard DB601B engine which was in the Bf-110C-2/C-4, (this engine was the same as the DB601A engine which was in the 109E-3/E-4, but re-named) but instead were equipped with the same low alt variant, (DB601Aa) engine which equipped the 109 E-4B Jabos, although in the Bf-110's case, this engine was called the DB601Ba. We will be creating this new model. In effect in TF 5.0, players will get an aircraft will performs much better at the lower altitudes the Fighter-Bombers operated at. There will be two versions of this model, the C-4B and C-4B Late, with the Late model having the ability to use 1.45ata ata boost. The original developers designated the Bf-110C-7 as the game's ground attack type, (which it historically was) but made the error of equipping the Bf-110C-7 with DB601A engines, when in fact this aircraft had DB601P's, which was the re-named twin engine version of the DB601N engine which equips the 109E-4N and 110C-4N. We will be revising the aircraft engines to match the real type. There will be a full power version, and a De-Rated version of this aircraft. The C-7Late will be eliminated. There is also the possibility we may introduce the Bf-110C-6, which was the heavy Zerstorer, aka. ground attack version which had the two MG/FFM's replaced with a single MK-101 30mm cannon. This was a very slow firing, (230 rounds per minute) very heavy, but very high velocity cannon which could pierce the rear armour of quite heavy tanks with armour piercing rounds as well as being able to fire high explosive rounds against soft targets or bombers. Apparently only 12 of these were made, but a number of these were available in 1940. As far as I know, the 3D model changes required to create this aircraft are fairly simple. Anyone who has data on the C-6, please PM me. Thanks to all for their patience in reading this. Last edited by RAF74_Buzzsaw; Jan-19-2018 at 00:43. And on a similar front, something else is cooking. Here's a hint..
V1 or more likely Me-262 ? That's really a big big news!!!! 1) The armor difference should be more marked between the C-4 and the C-2 models in respect to now. The 303 caliber was unable to pierce the armored windscreens of the Bf 110 C-4 and the new added armor plates around the pilot and the rear gunner. 2) Linked in some way to the argument written above there's another point that is quite important to mark more the difference between the early variants of the Bf 110 and that is important to improve the rear gunner survival rate in respect to now.
" Machine gun in firing and stored position: in C-4,C-5 and C-7 variants enabled fire with the canopy either in open or closed position "
This is a very important feature, in my opinion, that actually is missing in TF 4.312. 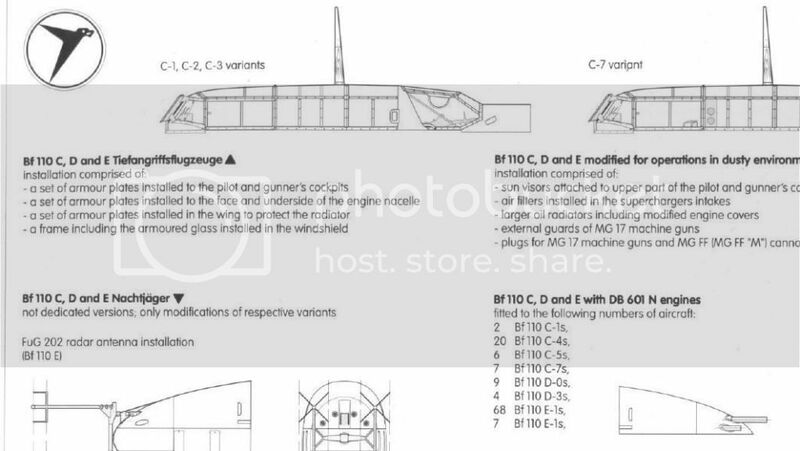 Should be really great if there will be the chance of firing with the rear gunner with the rear canopy either in open or closed position on variants from the C-4 onwards and this feature can be implemented in TF 5.0. Note somehow that the arc of fire of the rear machine gun was more limited when in closed position. 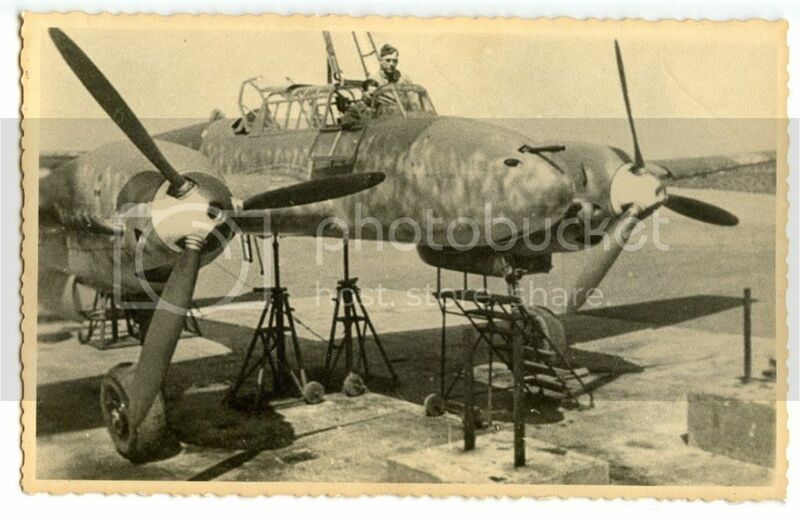 3) There should be more balance between the engine damage sustainable by the Bf 110 in respect to the enemy fighters. Once the bf 110 engines are damaged they very soon brake and stop ( I mean water and oil radiators losing liquid and venting ). When you damage an enemy fighter on your six with the same level of damage as above( I mean water and oil radiators losing liquid and venting ) they seems to be capable to fly for a lot longer time in respect to the Bf 110 in the same conditions. More than one time I've noticed that an enemy fighter with water and oil radiators losing liquid and venting ( and sometimes with the engine already stopped ) was capable of fly more faster than a bf 110 with the engine not damaged and operational. I personally think that the balance between fighters about this aspect is quite good ( their damaged engines last almost for the same time ) but it's not so between fighters and fighter-bomber or fighters and bombers. That's one of the main causes that permits to attacking enemy fighter to stay glued at your six also if crippled by bullets or badly damaged. I think that this aspect should deserve at least some investigation by Teamfusion. 4) More balance between maneuverability of the Bf 110 and the Blenny: although they have very similar weight,wingspan and wing area the Blenny turns almost like a fighter and the bf 110 in comparison seems a flying rock. 5) Improving the bf 110 cruise speed in perfect leveled flight: actually you get a speed of about 400-420 km\h in perfect leveled flight with all the variants that we have available. I think that instead a reasonable and historical cruise speed for the Bf 110 should be no less than 520 km\h (in perfect leveled flight). Actually chasing a Blenny requires a lot of time due to the actual limited speed of the Bf 110 and renders the life more hard when trying to extend. 6) The loss of control of the control surfaces and maneuverability when flying at high speed it's not bad but should be investigated a bit: it seems to me a little bit too excessive in the game. 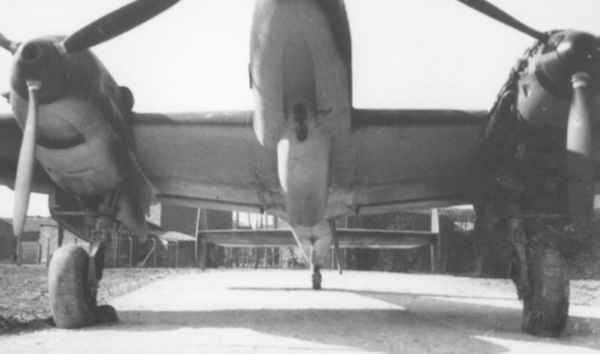 The " N " indicated just the type of engine installed on the aircraft not the variant ( normally on images of real bf 110 equipped with DB 601 N you will notice a small white " N " on the engine nacelles indicating the engine type ). As I've said above your work is extraordinary and I really appreciate all your continuous efforts to improve the game and I know that this kind of stuffs requires a lot of commitment and are time consuming so these are not criticisms but just possible suggestion\advice to possibly help you in the continuation of your very great work! My best regards and my best thanks to all the TF Team! Last edited by xvii-Hardegen; Sep-22-2015 at 02:27. All pilots are created equal.Then some become Bf 110 and Ju 88 pilots! Excellent news - my gunner and I are very excited by this. Thanks too Hardegen for all the extra info. What General Weygand has called the Battle of France is over ... I suspect that the Battle of Britain is about to begin! Thanks for the update and for all your continued efforts Buzzsaw old chap! Looks like my retirement fund. So . . . will all versions of the C7 then have auto prop pitch in TF5? Or none? Right now I think the C4 has it, the C7 does not, and the C7/late does. What will it be on TF5? You've made a big post Hardegen, I will comment on a few things you mentioned. Regarding the British pilot story, we don't make changes to either FM's or DM's based on anecdotes. There are DM values for different materials types in the game, ie. glass, wood, aluminum, steel, iron, hardened steel, etc. based on the type, modified by the thickness of the object. We will look at those and adjust them for all aircraft. So we will make sure the appropriate thickness and type of materials is in place for a given 3D object, and let the chips fall where they may. We will look at the rear gunner position for the 110's and hopefully we can make sure it is being implemented correctly. We will be looking at this. The Blenheim actually had lower wingloading than the 110, as well as (from my calculations) a higher lift aerofoil. So its initial turn should be better. However, the sustained turn likely needs looking at... the 110's induced drag coefficient is too high and will be adjusted... overall the 110 should see less energy bleed in TF 5.0. Not sure where your figures are coming from... the C-2 and C-4 should do 440 kmh max at sea level and have a max True Airspeed (TAS) of approx. 525 kmh at altitude. That was historical. A cruise speed of 520 kmh is much too high, especially if that is at altitude and you are reading Indicated Airspeed (IAS). 520 kmh IAS at the C-4's Full Throttle Height would be 665 kmh TAS... that is faster than a P-51's cruise speed. Re. the Blenheim... it was quite fast at sea level... and in a sustained chase it can maintain maximum throttle because the prop pitch setting does not allow max. rpms and therefore overheat is not a problem. The result can be you require a long chase to overhaul one if you are in a 110. At higher altitudes, the 110 is easily faster. The TF 4.312 Bf-110 actually rolls better than either the Spitfire or 109 at higher speeds, and has better elevator response than the 109... I built it that way based on the data... at the same time this was a large heavy twin engined aircraft, with a wide wingspan, and with two very heavy engines located in the wings which provided a lot of inertia to overcome. Sorry I am going to have to disagree with you again. Below is one of a number of documents which refer to the DB601P as a sister engine to the DB601N. Essentially the DB601P was exactly the same as the N model, with the exception that the prop/engine gear ratio was 1:1.88 instead of 1:1.55. These engines were used in the multi-engined aircraft types, including the 110. The ground crews may have generally referred to the engine as a 'N', and it would be marked the same for fueling purposes, both requiring C type fuel, but there was a difference between the engines which equipped the 109's and the 110's. And for game purposes, since the engine/prop ratio is modeled in the FM files, this is something we need to take note of. The Luftwaffe and Daimler Benz used this system of naming engines which were installed in twin engined types with a different designation, so the DB601A was a B when in a twin, the DB601Aa was a Ba when in a twin, the DB601N was a P when in a twin, the DB601E was an F when in a twin... etc. As mentioned, I'd be happy to see anything you might have on the 110C-6. Last edited by RAF74_Buzzsaw; Sep-23-2015 at 00:36. Wow. Gobsmacked at the levels of detail u guys go into. A very big thank u to TF and all who contribute. very exciting news! Your work is so much appreciated. If this will require model updates, will we be succumbing to a little more version creep moving forwards? Yes, both versions of C-7 will have auto pitch. C-2, C-4 and C-4B will have manual. Hardeganm I know you believe your rear gunner should be harder to kill. Armour stops a round or two sure. There are eight 303 machine guns. Armoured glass shot with eight 303's will fail. Each strike degrades its ability to take on the next. It's meant for the one off hits to hopefully give the guys a chance. It's not a tank. If you have access to a rifle, go into the bush and see what a 30.06 will punch holes in. Up in Yellowknife I have seen old gold mining gear shredded with bullets. I'm talking the old riveted 1" steel plate. You can see deflection strikes and some of those also penetrate. You also find beer cans, have to be drunk to shoot this kind of stuff. People are dumb and in the arctic no one can see you be stupid. The Boiler which was 4" thick had bullets embedded in it. Face strikes, I would never ever do that. Civilian hunting rounds not military armour piercing. Yahoos. Last edited by 7./JG26_SMOKEJUMPER; Oct-01-2015 at 19:26. Regarding the engines of the Bf 110, none of them were equiped with DB 601 B or P engines. all of the early C- and D-Series were equiped with DB 601 A engines. Also see the prop/engine gear ratio 1:1,55 in the document. 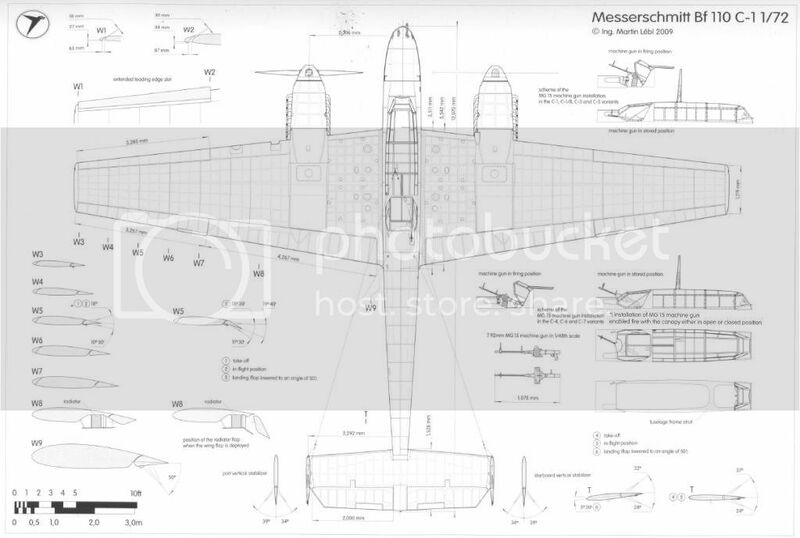 Even the Dornier Do 215 had DB 601 Aa engines. and Jesus said: "Be like the Otto-flame-carburetor at the cylinder of the lord. Don't judge above those who seek salvation in an Ackerman steering or hollow-casted three-spokes-light-metal-wheels, because even the casting-wheel-wanker is an image of god." And it is furthermore written: "Thar where more than three exhaust pipes in my Name are together, is a four-in-one system. Amen."